Hickey was arrested in Brazil in August. 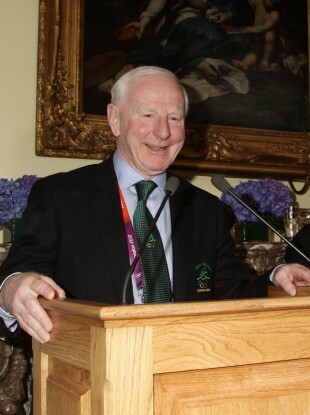 AN INTERNATIONAL OLYMPIC umbrella organisation has committed to lending money to former OCI president Pat Hickey, paving the way for his return to Ireland from Brazil. The Association of National Olympic Committees (ANOC) confirmed that it would lend a sum of money to Hickey in a statement. Hickey was arrested last August on charges of ticket-touting, formation of a cartel, and illicit marketing, and has since temporarily stepped down as head of the Olympic Council of Ireland (OCI). Pat Hickey’s legal team has confirmed that the bond money required for the release of his passport has been received in Brazil in recent days. Lawyer Simone Kamenetz this afternoon confirmed that the amount of one and a half million Brazilian reals arrived into the country in the past couple of days. Now, the legal team are waiting for the money to pass through banking compliance systems, so that it may subsequently lodged to the courts. Earlier, the Association of National Olympic Committees (ANOC), of which Hickey was vice president, said it would pay the amount of one and a half million Brazilian Reals (around the equivalent of €410,000), as required by the Brazilian courts in order for Hickey to get his passport back, liberating him to leave Brazil, and return to Ireland for medical attention. This morning, senior counsel for Hickey, Arthur Lavigne, said that he knew nothing of the payment, or its origin, and that the bond had not been paid. However, hours later Kamenetz confirmed that the money has indeed reached Brazil, and will be lodged to the courts, once it is cleared by Brazilian banks. “The money cannot be lodged directly to the courts, from overseas. The courts do not handle foreign currency. The lodgement is passing through the bank’s compliance, and will be liberated in the coming days. Then it will be paid to the courts,” she confirmed. Kamenetz said that Hickey is “much more animated now that he knows he can go home”. She said that Pat Hickey already has made an appointment for a medical procedure in Ireland on his return, but she was not aware when this is scheduled, adding that her client is happy that he can return home to see family and his own doctor. It is likely that on receipt of a payment to the courts, the actual return of Hickey’s passport could take around 5-7 days, depending on how quickly the responsible judge can formally order its return. The bail conditions laid down by the courts in Rio de Janeiro state that the passport may be returned so that Hickey travels home to receive medical attention, but that he must be willing to fully comply with the ongoing legal process in Brazil, and return as requested by court officials. Once paid, the bond amount would be returned on completion of the legal process, if the accused were acquitted. If condemned, the bond amount would be used to meet legal costs, fines, or compensation arising from the case. The bond amount would be refunded in full if the case is shelved before reaching court, as has been requested by the legal team. A request to shelve the case was denied by the Special Court for Supporters and Large Events in recent weeks. When granting bond conditions for the return of Hickey’s passport, the Judge Juliana Leal de Melo acknowledged the possibility that Hickey could leave Brazil, and not return. However, she that this needed to be weighed up against his right to receive medical treatment, and the fact that Hickey does not have any ties to Brazil, where he has spent the last three months. The full bond amount will be retained by the courts if Hickey does not return to Brazil, as requested by the legal process. Earlier this month a judge in Rio de Janeiro agreed in principle to allow Hickey to return to Ireland on health grounds, and set a bond of €410,000 which must be paid as a condition of having his passport returned. The OCI said that it would not be fronting the money for Hickey to return to Ireland. When contacted by TheJournal.ie, a spokesperson for the OCI said they had no comment to make on the matter. The ANOC is an umbrella affiliation organisation of the 206 national Olympic committees. In its statement, the ANOC stated that the decision to lend Hickey the loan was approved by president Sheikh Ahmad Al-Fahad Al-Sabah and all ANOC vice-presidents. “The payment was made as a temporary loan so that Patrick Hickey could meet his bail requirements and return to Ireland where he can receive medical treatment for a heart condition,” it said. “The terms of the temporary loan make it clear that it must be repaid to ANOC in full. For legal reasons all other terms and conditions surrounding this bail payment will remain confidential. Hickey had denied any wrongdoing and all charges against him. Comments have been closed for legal reasons. Additional reporting Cormac Fitzgerald. Email “Pat Hickey set to return to Ireland as bond money for passport is received”. Feedback on “Pat Hickey set to return to Ireland as bond money for passport is received”.